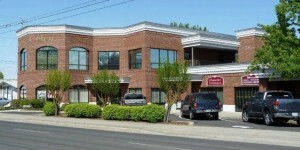 Approximately 3378 sqft of first class office space located at 750 Biddle Road, Suite 101. High exposure. Off street parking. Walk-in vault. Could be combined with additional space (upstairs Suite 201 (1568 sqft) and 202 (1854sqft). See separate listing. Both spaces currently occupied by Peoples Bank. Spaces to become available January 2018.